Skoda is riding high on the success of its car models in the country, especially in the premium sedan and saloon segment. It has now rolled out the new Skoda Octavia premium saloon in the country with three engine options and with three trim levels. The Skoda Octavia Ambition 1.4 TSI MT is the mid range petrol variant blessed with an advanced and high performance 1.4-litre turbocharged petrol mill. This engine has been skillfully equipped with a 6-speed fully synchronized manual transmission gearbox. The company rolled out this new model in the auto market with a very reasonable price tag, but still it gets incorporated with some of the top of the line features. This mid range trim has been blessed with stylish 16 inch Minoris alloy wheels, which is also offered in its top end variant. There are some of the most advanced safety features along with high quality comfort features offered inside this trim, which will pay off complete value for money. This premium saloon is offered with advanced safety aspects including an engine immobilizer system with a floating code, a remote control operation for locking and unlocking of doors, opening and closing of windows and so on. Inside this mid range trim, the company has offered the Superior Ivory leather seat covers, which will give a luxurious feel to the passengers. Coming to the exterior design and styling aspects, this Skoda Octavia Ambition 1.4 TSI MT trim comes with quite fascinating appearance that will surely get your attention. The front facade of this premium saloon is revolutionary and represents the company's approach towards the next generation style and design. The design of the headlight cluster is extremely sleek and edgy that adds aggressive elements to the front facade. In the middle there is a newly designed radiator grille that has been incorporated with a total of nineteen vertical slats and has been surrounded by a thick chrome strip. This will bring a distinct yet premium looks to the front facade. Below this, there is a body colored bumper that has been incorporated with a honeycomb grille for better air intake. Furthermore the fog lights on the bumper and the revamped company logo completes the overall front facade. The side profile of this mid range trim has been blessed with 16 inch Minoris alloy wheels , which will further enhance the elegance of the sleek side view. On the other hand, the ORVMs and the door handles have been painted in the body color while the outside rear view mirrors have been bestowed with side turn indicators. The rear profile of this premium saloon is equipped with decent tail light cluster that comes with C-Shaped contour design that dominates the rear profile. The interior cabin section of this new model is much more impressive than its exterior. The company has used superior Ivory leather fabric upholstery inside the cabin and covered the seats, steering wheel, gearshift knob and hand brake lever. Its interior is the area where you can relax and forget yourself by experiencing lavish comforts with ultimate entertainment. Its interior gets the dual toned Onyx-Ivory color shade on the dashboard, front central console as well as on the door panels. Also, you can notice the wooden design on the door panels and on the central console in the front cabin, which offers you a rich experience inside. There are several numbers of utility functions and equipments incorporated inside the cabin that meets all the requirements of the passengers. Features including cup holders, bottle holders, arm rest, glove compartment, 12v power socket, front sun visor with vanity mirror, lights-on acoustic signal and several other features have been given inside the cabin. Furthermore, central infotainment system with multiple functions will provide detailed information to the driver and occupants. There is no doubt that occupants inside the cabin will get to experience fascination while on the go. Coming to the engine technicalities and specifications, this Skoda Octavia Ambition 1.4 TSI MT trim is powered by the same 1.4-litre petrol trim that is also powering its base petrol variant in the model series. The company designed this turbocharged petrol engine with 4-cylinders and 16-valves and incorporated it with direct injection fuel supply system, which will make it even powerful than any other engine of its class. This engine displaces 1395cc of displacement capacity that enables it to produce a maximum 138bhp of power at 4500 to 6000rpm and yields 250Nm of peak torque output at 1500 to 3500rpm. This mid range petrol trim has been offered with a 6-speed manual transmission gearbox that comes with a fully synchronized system. The company offered the all new Skoda Octavia with a sophisticated vacuum assisted hydraulic dual-diagonal circuit braking system assisted by dual rate system. This braking mechanism enables the disc brakes fitted to both the front and rear wheels to work exceptionally well in all whether and road conditions. Furthermore, advanced Antilock braking system with electronic brake-force distribution system and hydraulic brake assist system assures a skid-free and stress-free driving experience. On the other hand, handling is made easier with the help of direct rack and pinion electro mechanic power steering system that is highly responsive and acts instantly as per the driver’s requirements on roads. 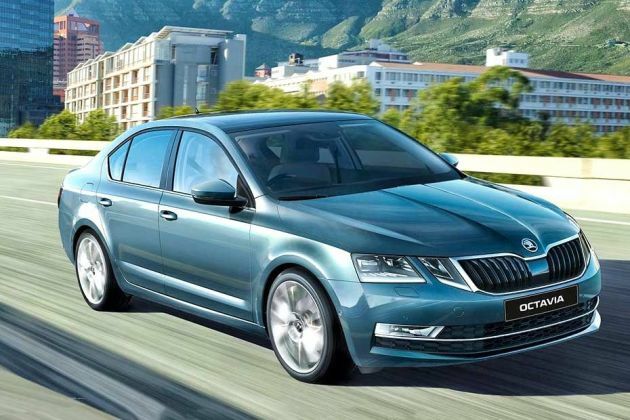 Coming to the comfort and utility features, this mid range Skoda Octavia Ambition 1.4 TSI MT trim is blessed with most of the top end luxury features that were offered with the high end variant in its model series. The list of features include a Climatronic dual zone air conditioner system, height adjustment for driver seat, front center armrest with adjustment for length and height, leather seating upholstery, electrically adjustable external rear view mirrors, power windows with one touch up and down operation, length and height adjustable steering wheel and many other such functions. It also comes fitted with an advanced Skoda Audio system that offers a high quality entertainment to the passengers on the go. The company has shown an uncompromising approach towards the safety and security aspects of this mid range trim. The company has equipped this petrol variant with some of the advanced features including high level third brake light, fuel supply cut-off in crash, acoustic warning signal for overrun speed, engine immobilizer system with floating code, remote central locking system and many more sophisticated functions. Pros : Trendy exteriors, top class comfort and safety features. Cons : Poor mileage, price can be made more competitive. Skoda Octavia Corporate Edition Petrol Exterior"Chrome surround for radiator grille /n Chrome inserts in front bumper and below window lines /n Body colour bumpers, external mirrors, and door handles /n Turn indicator in external mirrors /n Front fog lights /n Rear fog light/n Tinted windows /n Rear mud flaps /n "
Skoda Octavia Corporate Edition Petrol Comfort & Convenience"Parktronic sensors at rear /n Parktronic speaker at rear /n Height-adjustable three-point seatbelts at front /n Three -point seatbelts at rear /n Height adjustable head restraints at front /n One-touch operation /n Bounce-back system /n Telephone controls on multi-function steering wheel /n Gear change indicator (for manual transmission) /n Reading lamps at the front and rear /n Illumination of cabin storage spaces including front glovebox /n Illumination of luggage compartment /n 12V power socket in centre console /n Front sun visors with vanity mirrors /n Two foldable roof handles, at front and rear /n 590 litres luggage compartment space /n 1580 litres of total luggage space with rear seatbacks folded /n One foldable baggage hook in luggage compartment /n Six load anchoring points in luggage compartment /n 60:40 split and completely folding rear seat backrest /n Rear seat centre armrest with adjustable cup holders /n "
Skoda Octavia Corporate Edition Petrol Saftey"Halogen headlights with manual levelling /n LED Day Running Lights /n LED Tail lamps/n Warning indicators on front doors /n ABS (Anti-lock Braking System) /n EBD (Electronic Brakeforce Distribution) /n HBA (Hydraulic Brake Assistant) /n ASR (Anti Slip Regulation) + MSR (Motor Speed Regulation) /n EDL (Electronic Differential Lock) /n ESC (Electronic Stability Control)/n MKB (Multi collision braking)/n Dual front airbags /n Side airbags at front /n Seatbelt pre-tensioners for front seats /n Lights-on acoustic signal /n "